I received a picture via email just the other day of Joshua from last November. One of Lowell's cousins got married in Dallas (and since at the time we had nothing tying us down), we decided to go hang out with family for the weekend. One night after the wedding, we all went out to eat at a local restaurant at the stockyards. Now Joshua is one of those people who will try ANYTHING! 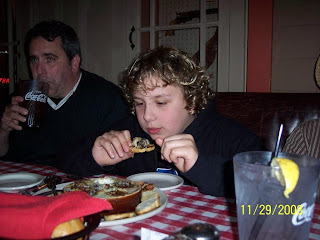 He looked over the menu and decided that he wanted to order some escargot for an appetizer. We decided that it was a special occasion and the rest of the family was egging us on to let him try them, so we agreed. I wasn't at all worried about him doing anything embarrassing when he ate them. I knew that he would swallow them all down if for no other reason than to prove he could do it. He's just like that. However, nobody will ever let me forget that when the waitress came by to take our order, he looks at her and confidently says, "I'll have an order of snails." Yep, he asked for snails. Of course, we all know that's what it is, but do we have to proclaim our lack of refinement in front of people who will remember it forever? Guess so!